In 1968 the BYU New World Archaeological Foundation NWAF worked at the Olmec outlier site of Xoc SE of Ocosingo, Chiapas. The principal attraction of the site was a 2 meter high bas relief figure carved into the face of a rock. When the BYU team returned for another field season four years later, a looter had removed the carved figure with a chain saw and the vandalized rock face was bare. See Susanna Ekholm-Miller, "The Olmec Rock Carving at Xoc, Chiapas, Mexico" in Papers of the New World Archaeological Foundation, Number 32, BYU NWAF (Provo: 1973). Unfortunately, this is a common occurrence in the Maya lowlands where most monuments are carved into soft limestone. Fortunately in this case, the original carving (cut into four pieces for easier transport) recently showed up in France where it was handed over to Mexican authorities who plan to repatriate the important work of Olmec art. This map shows the location of Xoc 190 air kilometers SE of the Olmec Heartland along the Gulf Coast. 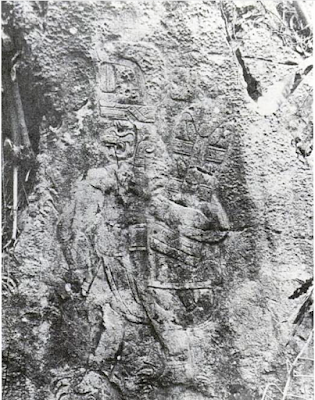 This photo shows the rock carving in situ prior to defacement. And this is an artist's rendering from Mike Ruggeri's fine collection of Olmec images. Some Mesoamericanists think the figure is a priest, others a warrior. He wears an elaborate headdress adorned with avian motifs. 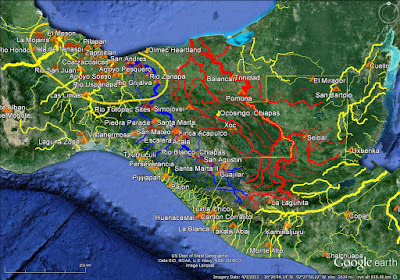 Xoc is one of only a handful of Olmec sites known from the Usumacinta drainage basin which is typically considered Maya territory.This relative paucity of Olmec sites is one of the many reasons I believe the Usumacinta is a stronger candidate for river Sidon than the Grijalva. See the article "The Usumacinta/Sidion Correlation." 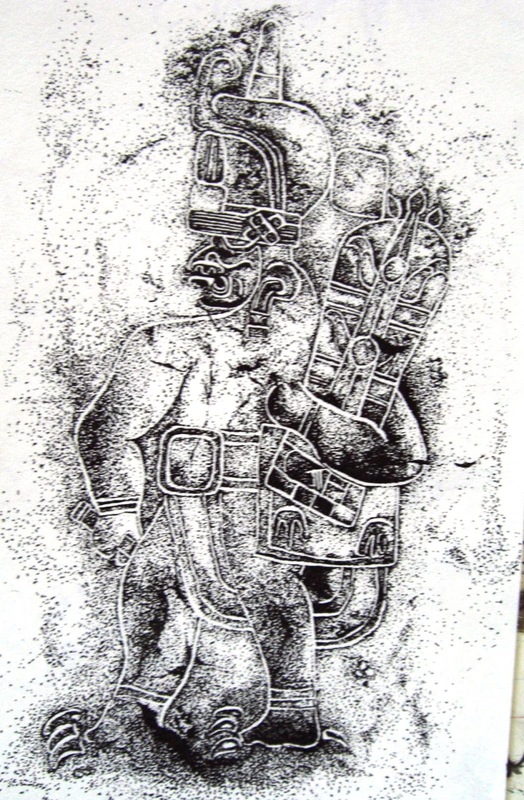 The Olmec sculptor who carved the Xoc rock face was probably a long way from his homeland just as Coriantumr was a long way from his native land when he carved the large stone stela none of his hosts could read that is mentioned in Omni 1:20-22.